Dutch teclo KPN is due to shut down its over-the-top TV service KPN Play on July 2 citing “insufficient demand”. In a statement the company said that the subscription online service, which offered a new way of watching TV when it launched in 2015, did not get sufficient traction. During June the company will make KPN Play available for free, stopping subscriptions automatically. Programmes will be unavailable after July 2. The KPN Play website will remain online until October 1, during which time users will be able to log-in and manage their account. KPN Play’s customer service will remain available until July 13. “We have learned a great deal from KPN Play and are using this for other products, including the KPN Interactive TV (iTV) app that is part of KPN’s internet and TV packages,” the company said in a statement posted to the KPN Play website. KPN said its iTV service – which is only available to KPN’s internet and TV subscribers, not on a standalone basis – will be offered to KPN Play customers as part of a special promotion. 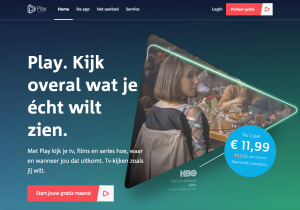 KPN launched Play in November 2015, offering a range of live channels and on-demand content for €11.99 a month for the first year, without an ongoing contract commitment. At launch it offered 22 linear TV channels including HBO, Comedy Central, TLC, Nickelodeon, Discovery personalised music channel Xite. The service also provided seven-day catch-up content from public broadcaster NPO’s three channels and the commercial stations SBS6, Net 5 and Veronica.